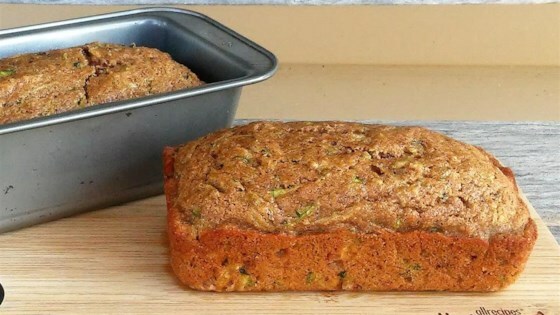 "A healthier alternative to some of the other zucchini breads out there that still tastes great!" Preheat oven to 325 degrees F (165 degrees C). Grease 3 mini-loaf pans. Beat zucchini, agave nectar, egg, coconut oil, applesauce, lemon juice, and lemon zest together with an electric mixer in a bowl until smooth. Whisk flour, cinnamon, salt, baking soda, and baking powder together in a bowl; mix into zucchini mixture until batter is just combined. Pour batter into the prepared loaf pans. Bake in the preheated oven until a knife inserted in the center comes out clean, 30 to 40 minutes. Cool bread in pans for 10 minutes before turning onto a wire rack to cool completely. This zucchini bread came out super moist and my 9 year old loved it! The lemon adds a great flavor!! Very good. Didn't taste "healthy" like some of the healthier recipes can. I used 1/2 white flour and 1/2 wheat, but otherwise followed recipe. I will make this again. Great flavor! I used honey instead of agave and Einhorn flour in place of ww flour. They turned out perfect and my kids gobbled them up. Super moist and the lemon-zucchini combo is on point.